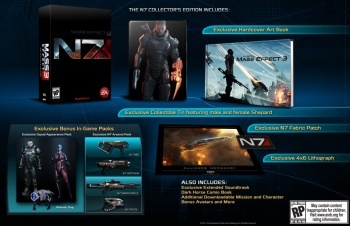 BioWare has taken the wraps off the Mass Effect 3 Collector's Edition, "the definitive edition" for serious Mass Effect fans. Nothing says "die-hard videogame fan" like a penchant for collector's editions. While the rest of you are out there just playing your games, those of us who take this business seriously are stocking our shelves with metal boxes, art books, soundtracks and exclusive content that less-discriminating consumers will have to wait literally days to get. Days! And so it is with Mass Effect 3, which BioWare has revealed will be available in both a standard, "I'm not a real fan" edition and a super-ultra N7 Collector's Edition, "the ultimate Mass Effect 3 experience!" What do you get for your money? Nothing less than a 70-page hardbound art book, a limited edition Dark Horse comic, a "premium fabric" N7 patch, a 4x6 lithograph print with unique artwork [didn't we used to call those postcards? ], a soundtrack, forum avatars and social badges, all wrapped up in a premium metal case emblazoned with commemorative image of a lean, mean Commander Shepard fighting machine! And let's not forget all the hot in-game content! The N7 Arsenal Pack will add the N7 sniper rifle, shotgun, SMG and pistol to the game, which by all rights should be significantly less effective than the high-end heavy hitters you're packing at the end of Mass Effect 2, while Commander Shepard will get his own unique N7 Hoodie to wear on SR-2 casual Fridays. The rest of the squad will have their own alternate outfits as well, and rounding things out will be a faithful new sidekick in the form of a robotic dog. That's right, a robotic dog. And how much will all this awesomeness [plus the robotic dog] set you back? Amazon has the CE listed at $79.99, versus $59.99 for the standard edition. Okay then, where do I put my money? Mass Effect 3 is scheduled for release on March 6, 2012. I'm heading straight down to GameStop to pre-order this and Assassin's Creed: Revelations as soon as my exams are over tomorrow. Holy assortment of arbitrary items Batman! Preordered it, though i wonder if they will have day one dlc. But looks good enough for me I want me a robotic dog. So the PC version will be 79.99? Generally you'd assume to get 10 dollars or so off for getting it PC, but knowing EA they'll leave all of the platform costs the same because they're jerks like that. Standard for me. I usually just shell out extra for figures and stuff. Soundtrack is always a nice touch, though. I read that it is being sold on the EA Origin service for just $60. Can anyone confirm? If the dog is available in mission I hope you can have the hamster in his spot if we import a game from Mass Effect 2, all opposition shall fall before Boo. OT: Wow, that seems cheap considering what these things usually cost. I don't usually go for collector's editions, but I'll probably make an exception for this one if it really is that close to the standard price. I am naming the dog K-9 and if anyone tries to stop me I will hurt them! Getting this, especially for the art book. I will buy it anyway tho. LOL Shepard in a hoodie. Is anyone else not able to form that mental picture? I mean, I really like the games, but I'm not spending money on that. Shepard isn't just the saviour of the galaxy, he's also down with the children. I got the ME2 CE for the same $80, and that had less stuff than this one. So I'll probably end up getting this CE as well. Sold. It'll look great next to my Collector's Edition of ME2. Instead of the robotic dog, why don't we just get Urz? "Whoosh my good widdle Vawwen!? Yesh you are... YESH YOU ARE!! Now go tear the mean, wittle Cerberus baddies to pieces. Good boy!" I want this game...NOW! GET IN MY PC! Gah! Can't find it in any UK retailer! Can somebody tell me when and where it'll be listed for the UK? EDIT: Nevermind, found it! It's at Game.co.uk for anyone looking to get it in the UK. Hmmmmmm... My exams should be over by march 6. I think. In any event HELLS YES!!!! I seriously regretted not getting the limited edition for Mass 2, perhapse now I can make it right again. Love the look of the the Omni-tool switchblade, looks awesome! 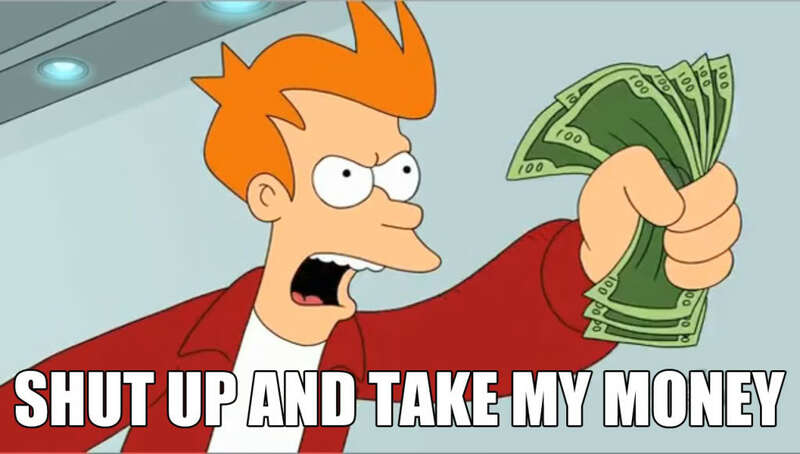 A video game soundtrack from Clint Mansell? Sorry, L.A. Noire DLC. This money's going towards a good cause. EDIT: Curses! Beaten to the punch!